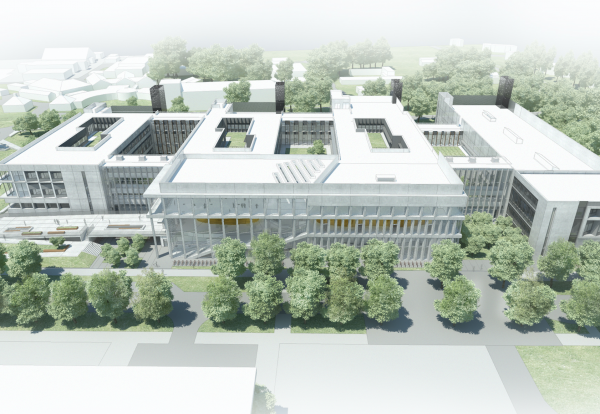 Cambridge University has awarded its first major project using the new contractor framework to deliver a replacement for the world famous Cavendish physics laboratory and a hub facilities building. Contractor Bouygues UK and Bouygues Energies & Services will provide consultancy support to the university’s existing project team to develop the proposals under an £8.5m professional services contract to provide preconstruction input. The team will also be supported by design partners NBBJ and BDP to work up detailed designs for the university’s West Cambridge campus. The £300m scheme for Lynxvale Limited, the development arm of the University of Cambridge ranks as one of its most ambitious in the long-running expansion programme. The Government has committed to invest £75m into the new Cavendish laboratory, with the university also reported to have received a £150m philanthropic gift to contribute towards the cost of the new lab. Design work will run for a period of up to 18 months with construction set to begin in early 2019 with a target completion date of December 2021. The Cavendish III laboratory will be a purpose-built centre for world-leading research for the university’s Department of Physics, bringing the large number of research groups in the department together under one roof to encourage collaboration. Scheme design is by Jestico + Whiles with CH2M, and they remain client side. NBBJ and BDP are taking the design through to completion. The 344,500 sq ft, Cavendish III will house a range of laboratories, offices, clean rooms, workshops and multiple lecture theatres. There are also challenging criteria to be met in relation to temperature and humidity control and EMI protection. An associated 54,000 sq ft independent Shared Facilities Hub will provide catering, collaborative teaching, meeting, study and library spaces to the West Cambridge campus. Once the Department of Physics moves out of the current Cavendish lab, its site will be used for a new building for the Department of Engineering.